ab4469 specifically recognises the four isoforms of EED following the immunoprecipitation of tagged Ezh2 from HEK293 nuclear extract. However, using HEK293 nuclear lysate ab4469 predominantly recognises non-specific bands. Synthetic peptide conjugated to KLH derived from within residues 1 - 100 of Human EED. Our Abpromise guarantee covers the use of ab4469 in the following tested applications. WB 1/200. Predicted molecular weight: 49 kDa. Polycomb group (PcG) protein. Component of the PRC2/EED-EZH2 complex, which methylates 'Lys-9' and 'Lys-27' of histone H3, leading to transcriptional repression of the affected target gene. The PRC2/EED-EZH2 complex may also serve as a recruiting platform for DNA methyltransferases, thereby linking two epigenetic repression systems. Genes repressed by the PRC2/EED-EZH2 complex include HOXC8, HOXA9, MYT1 and CDKN2A. Expressed in brain, colon, heart, kidney, liver, lung, muscle, ovary, peripheral blood leukocytes, pancreas, placenta, prostate, spleen, small intestine, testis, thymus and uterus. Appears to be overexpressed in breast and colon cancer. Belongs to the WD repeat ESC family. Expression peaks at the G1/S phase boundary. Nucleus. Chromosome. Transiently colocalizes with XIST at inactive X chromosomes. Lanes 1 - 4: Merged signal (red and green). Green - ab4469 observed at 55 kDa. Red - loading control, ab8245, observed at 37 kDa. ab4469 was shown to recognize EED in wild-type HAP1 cells along with additional cross-reactive bands. No band was observed when EED knockout samples were examined. Wild-type and EED knockout samples were subjected to SDS-PAGE. ab4469 and ab8245 (loading control to GAPDH) were diluted 1/250 and 1/1000 respectively and incubated overnight at 4°C. Blots were developed with Goat anti-Rabbit IgG H&L (IRDye® 800CW) preadsorbed (ab216773) and Goat anti-Mouse IgG H&L (IRDye® 680RD) preadsorbed (ab216776) secondary antibodies at 1/10,000 dilution for 1 hour at room temperature before imaging. Rabbit polyclonal to EED (ab4469) on U20S cells. Antibody used at 1/100. U20S cells were fixed with PFA (3.7%), permeabilised with PBS 0.1% Triton. Counterstained with Hoechst. Cells were examined with Axioplan 2 microscope (Zeiss). 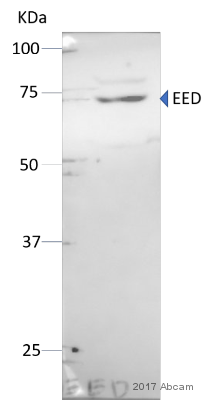 Secondary antibody: donkey anti-rabbit (Cy3). ab4469 recognizes the full-length recombinant EED protein which has an expected molecular weight of 80 kDa (tagged). Publishing research using ab4469? Please let us know so that we can cite the reference in this datasheet. I had tried 5 times used the ab4469 antibody and It did not work. And I had tried 5 times, so I bought another antibody UPSTATE:17-663, and had got the anticipate result. The condition were as follows: The concentration of the primary antibody was 1：1000; The concentration of the secondary antibody was 1：5000; So I thought there was something wrong with this antibody and did not want to try again. Thank you for contacting us. I am sorry that the results did not improve. I would like to ask how you would like to proceed with this case. In order to help you further I would need more information about order number. The order number you have provided does not match actual Abcam order. It looks like you are from China and you may have purchased this antibody from our Chinese distributor. Please contact them for contacting us for further instructions. Please be advised that I can only provide free of charge replacement or refund/ credit note if the antibody was ordered within Abcam guarantee period; which is 4 month for Chinese customers. If you are not from China please accept my apologies for misunderstanding and provide me the correct 6 digit Abcam order number. I hope this information is helpful to you. Please do not hesitate to contact us if you need any more advice or information.